The pull-down spray wand comes free with a gentle tug and gives you total flexibility. The hose extends and retracts without friction points, fed by gravity. As you raise the wand to dock it, the magnet embedded in the spout pulls the wand precisely into place. So, unlike other pull-downs that tend to droop over time, MagnaTite keeps your pull-down faucet looking picture-perfect. A toggle on a Multi-Flow wand increases the stream from the standard 1.5GPM to a higher flow to more quickly fill the sink as well as pots, vases, or other large containers. Toggle back to 1.5 GPM for normal, everyday use. The innovative Multi-Flow feature can be found on a variety of Delta kitchen faucets. Delta's exclusive DIAMOND Seal Technology uses a valve with a tough diamond coating. InnoFlex PEX waterways keep water inside the faucet out of contact with potential metal contaminants. This powerful combination brings you a faucet built to last up to five million uses. Touch on. Touch off. With Touch2O Technology, it doesn't matter if you have two full hands or ten messy fingers. Tap anywhere on the spout or handle of the faucet with your hand, wrist or forearm to start and stop the flow of water. Thoughtfully designed to make kitchen tasks easier, Touch2O Technology allows you to turn the faucet on and off with just a touch anywhere on the faucet's spout or handle. Designed for precise, responsive control every time, no matter where you touch. You can easily control and change the water temperature above the deck using the faucet handle. All Touch2O models are water-efficient, underlining Delta's commitment to conservation. The pull-down spray wand comes free with a gentle tug and gives you total flexibility. The hose extends and retracts without friction points, fed by gravity. As you raise the wand to dock it, the magnet embedded in the spout pulls the wand precisely into place. ISPRING's pull-down kitchen faucet brings the professional look and feel to your home kitchen. Equipped with single-handle control and ceramic disc cartridge, this ISPRING kitchen faucet will not only have contemporary appeal, but also convenience, precision and durability. For a modern look and excellent durability, choose this ISPRING kitchen faucet with a luxury triple plated physical vapor deposition (PVD) chrome finish. Its high-arc spout swivels 3600 and provides extra clearance for deep pots and pans. It also allows changing from a steady stream to a powerful, high-volume spray with a touch of a button. It has Single Handle control which provides ease of operation with one hand. Industrial look of the spring spout for a gourmet kitchen. 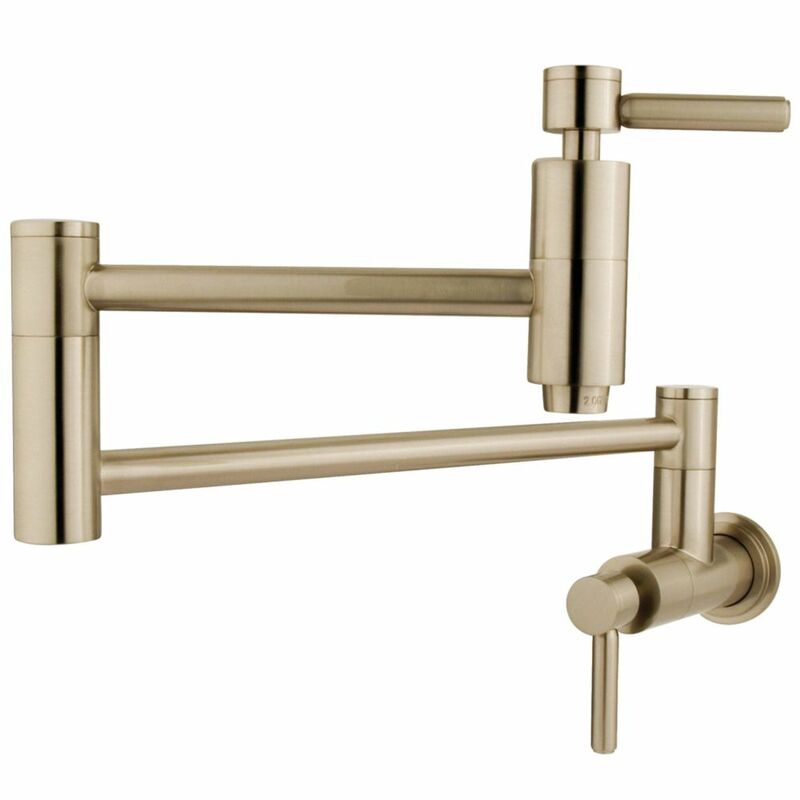 The modern pull-down faucet offers a high clearance below the spout for filling and cleaning large pots. High-arc spout swivels 3600 to offer complete sink access. Wall-Mounted Potfiller in Satin Nickel Potfillers are the centrepiece of fine kitchens. Dual shut off valves for convenience. Two-piece articulated spout folds out of the way when not in use. Wall-Mounted Potfiller in Satin Nickel is rated 4.8 out of 5 by 14. Rated 5 out of 5 by Mamaj from I seriously love this pot filler! (AND, know that the satin nickel is NOT a golden tone as appear... I seriously love this pot filler! (AND, know that the satin nickel is NOT a golden tone as appears online. It is a true satin nickel/stainless steel look.) We moved into our house about 6 years ago--the previous owner had a pot filler installed. I enjoyed the convenience of the pot filler, but it was splashy when filling pans and the flow was fairly slow but I didn't know any different until we installed this pot filler. It has a super fast flow and NO SPLASHING when filling pans. It was decently easy for my husband to install--he did have to add more teflon tape because the filler dripped at the wall at first. But, it was an easy fix and has held up fine after a month of pretty heavy use. I ordered 3 pot fillers to see which style I liked the best. I liked the modern look of this pot filler and it was the heaviest/sturdiest of the 3 I bought--including a Delta brand filler that was more than twice as much money. Rated 5 out of 5 by Federal from Looks great-not installed yet as new construction property.... Looks great-not installed yet as new construction property. Rated 5 out of 5 by Virginia from Great looking piece, very sturdy.... Great looking piece, very sturdy. Rated 5 out of 5 by Michael from The instructions could have been a little better if they... The instructions could have been a little better if they would have provided a drill size for the anchors. But, other than that it was easy to install and a very nice product. Rated 5 out of 5 by Jessica from Not installed this yet bc not @ this stage in... Not installed this yet bc not @ this stage in build BUT really jazzed at how heavy/quality of fixture/price/pt. Huge & will reach all burners on range. Discerning tastes will approve.